The headstone of Private James Whitley (ca. 1924-1944). 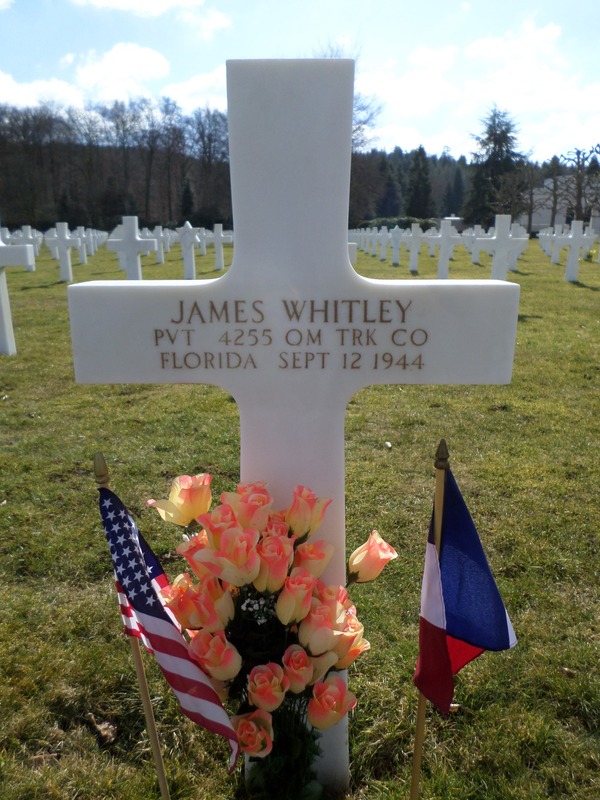 A native of Orange County, Florida, Whitely was a private in the U.S. Army during World War II. He died during his service in France and is currently buried at the Epinal American Cemetery and Memorial in Dinozé, France. Whitley is one of 85 Florida residents interned at Epinal. He was born to John Whitely and Rachel Whitley sometime around the end of 1924. As an African-American, Whitley grew up in segregated Orange County. He was drafted into the Army on February 9, 1943, and was assigned to a segregated unit in the 4255th Quartermaster Truck Company. Whitley's unit transferred to Hampshire, England, on June 30, 1944, where they managed supplies for the invasion of Europe by the Allied Forces. Whitley died during combat in France on September 12, 1944. He was awarded the American Campaign Medal, the World War II Victory Medal, and a Purple Heart for his service. Original color digital image by Dwight Anderson: Private Collection of Dwight Anderson. Originally created by Dwight Anderson and published by Find A Grave. Copyright to this resource is held by Dwight Anderson and Find A Grave and is provided here by RICHES of Central Florida for educational purposes only. "Pvt James Whitley." Find A Grave. http://www.findagrave.com/cgi-bin/fg.cgi?page=gr&GSln=Whitley&GSfn=James&GSbyrel=all&GSdyrel=all&GScntry=7&GSob=n&GRid=56376324&df=all&. "James Whitley: United States World War II Army Enlistment Records." FamilySearch. https://familysearch.org/ark:/61903/1:1:KMVK-BW1 (accessed October 20, 2015). "James Whitley: United States Census, 1940." FamilySearch. https://familysearch.org/ark:/61903/1:1:VTC4-NZK (accessed October 20, 2015). "World War II Army Enlistment Records." National Archives. Last modified September 30, 2002. http://aad.archives.gov/aad/record-detail.jsp?dt=893&mtch=168&cat=all&tf=F&sc=24994,24995,24996,24998,24997,24993,24981,24983&q=James+Whitley&bc=sl,fd&sort=24996%20desc&rpp=50&pg=1&rid=4950307&rlst=5191388,5184322,177367,4950307,5213432,5081800,6251237,6257171,1101903,5671352 (accessed October 8, 2015). Anderson, Dwight. 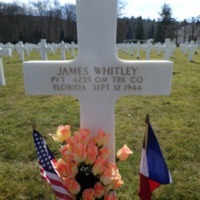 “Headstone of Private James Whitley at the Epinal American Cemetery and Memorial.” RICHES of Central Florida accessed April 19, 2019, https://richesmi.cah.ucf.edu/omeka/items/show/6530.